January | 2010 | Abez sez Assalamualaikum! I could have cropped the photo better so that the car was centered, but I wanted to leave in the pretty palm trees to the right. 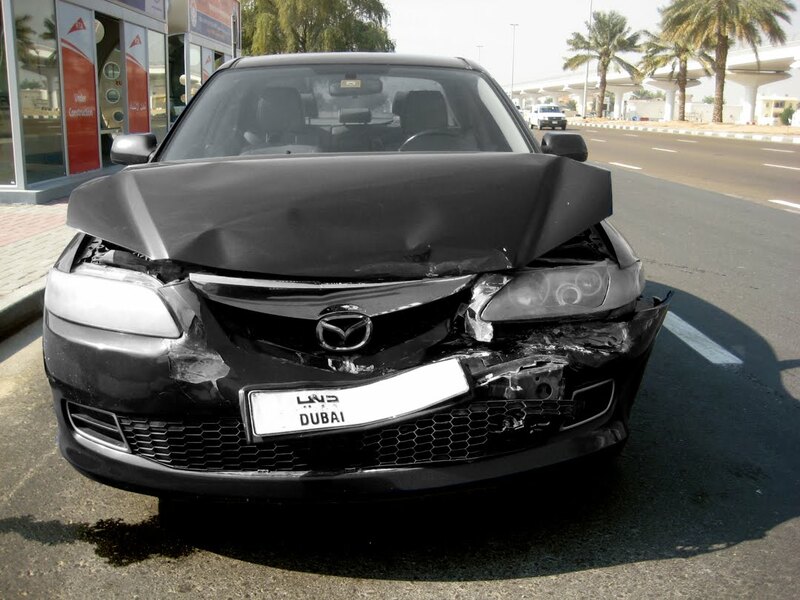 This is Nahda Road in Dubai, and that is my car. Actually, it’s Allah’s car. He gave it to us, and if He chooses to, He can take it back. Legally, HF owns it, and presently, the mechanic possesses it in his repair shop. I’m not sure how many arms and legs the repair will cost, but InshaAllah, the car can be repaired. And Alhamdulillah, no one was hurt. I rear-ended a man who stopped suddenly when a gardener ran across the road, but I was buckled up and did manage to slow the car down a tiny bit before the impact. Alhamdulillah, the gardener made it safely to the other side, and the other guy’s car- a black Peugot 307- must have had a seriously strong bumper, because compared to the damage I did to our poor Mazda, his was negligible. His bumper will need repainted. My radiator will need replaced. HF, being the awesome HF that he is, thanked me for crashing the Mazda, because he wanted a Lexus anyway. And Owlie zoomed to my rescue (only getting moderately lost) and filled her car with everything that had been filling my car- the safety seats, shopping, toys, clothes, etc. And my inlaws very lovingly arranged for a tow-truck to come and collect the car and take it away to the mechanic. And then I took a cab for the one kilometer between myself and my destination, and life proceeds as normal except with considerably less driving. Alhamdulillah. One could be cynical and say that when it rains, it pours, but it would be more accurate to say that rain is a blessing from Allah, no matter when and how it comes, and sometimes it may be a bit too much for our taste, but we have no idea what the greater purpose and benefit of the storm is. Not that it’s storming. It’s been a little drizzly lately in Abezville, but I refuse to be soggy and miserable. I’m going to play in the rain and jump in the puddles, InshaAllah. Lab Technician: Ah, a BHCG test, expecting a baby? Me: No, having a miscarriage. LT: Oh, uh- I’m sorry. Once upon a time I was in the US for Owlie’s wedding, and two days after arriving, I found out I was pregnant. And then, after four days of baby shopping, and quietly thinking of names, and imagining sweet little faces with HF’s big brown eyes, I found out I was having a miscarriage. And then I was on the next flight home, a week after I had arrived and a week before my original return. And here I am today. Blogging. Because it would seem that my blog fulfills many roles, one of which is catharsis. And I’m an extremely logical person, but my own brain is baffled by how deeply you can mourn something that was never yours and was never meant for you to begin with. I can’t say that I’ve lost a baby, because the baby was never mine. If Allah had willed that child for me, the entire world could not have withheld it from me. But He did not, and so the entire world can not grant it to me. And the miscarriage was not my fault, and could not have been caused by anything I did or by any medicine I could have taken. The doctor very kindly said so. Which was nice, because up until that point I had been mentally crucifying myself for taking my daily migraine medication. Never mind that I had no idea I was pregnant until three days before I miscarried. I’m a mom, I blame myself for things. The flip side of taking responsibility for your children is that you blame yourself when something happens to any of them, even an embryo that was never meant to be born. And you cry, and you cry, and you cry. And when no one is looking, and Abu Dhabi is flying past you at 155 kph with the highway roaring and the nasheed blasting, you cry when you remember what you’ve been trying so desperately to drown out. A few people know, and they ask about me because they care, not because they’re trying to stick their fingers into the gaping, bleeding, hole in my heart. I have to pull myself together and be polite, and patient, and coherent, and talk about things in terms of BHCG levels and non-viability and natural termination. I have managed to not cry in front of anyone but HF and the speed radars on the Abu Dhabi/Dubai highway, not because I’m being Stoic, but because I don’t want anyone’s pity, especially my own. I’m healthy, I’m ok, I am free from permanent physical effects of what was an early and natural miscarriage that required no medical intervention, chemical or surgical. I have two beautiful, amazing children and no reason to believe that I cannot have more, InshaAllah. I have the most loving, supportive, water-proof husband in the entire world, who not only knows what to do with a wife who is crying so hard she’s incoherent, but also to make her stop, and eventually, even smile. Logic and emotion are both part of human nature, and insane, frantic, overwhelming love for your children is part of a parent’s nature. I am allowed to be sad, but I am also required to fight through the blinding storm of grief and find the knowledge that Allah doesn’t test anyone more than they can bear, and all that’s required of me to pass this test is to keep faith and be patient. Verily we are God’s, and to Him we return.